NYFA: What is your personal background and how did you get your start in filmmaking? Cheryl Bedford: My mother took me to see my first Broadway play, A Little Night Music, when I was a kid. I fell in love with the arts and knew that was how I was going to spend the rest of my life. I didn’t know which aspect of the arts, but to me, there was no other way to live. NYFA: Is there a particular film or filmmaker who inspired you to pursue an education and career in film? CB: Actually no. Just my mother, who encouraged me to follow my dreams. NYFA: You’ve produced and worked on a large number of films. Which ones are you particularly proud of and what are some of your fondest memories working in film? CB: Two of my favorite films are The Mannsfield 12 and Dark Girls. M12 was the best time I have ever had on set. I prepped it well, had a great crew, worked with my one of my favorite directors, Craig Ross, Jr (who is like a brother to me and now teaches at NYFA as well), worked with one of my favorite DP’s, Carl Bartels (who now teaches at NYFA). It was just easy and everyone got along so incredibly well. Dark Girls is special to me for a host of reasons. First, the subject matter is close to my heart. It was a passion project. It was nominated for a NAACP Image Award (as was I). I come from a family who fought in the Civil Rights Movement. The Image Award Nomination means that I worked on a project that the NAACP recognizes and as a black person in the Entertainment Industry, that is HUGE! NYFA: What do you consider the role of a producer to be? Obviously there are many different types of producers—be they line producers, assistant producers, executive producers, etc.—but do you feel there is a commonality that applies across the different types of producers? CB: For a “true” producer, one who produces a movie from inception through post, I tell my students this…”Nothing should be a mystery.” We should know every line item in a budget, how much everything from a ribbon to a nail to a card reader costs. NYFA: What advice would you give to aspiring producers in developing both the creative and business skills to produce a film? CB: Learn everything and never think you know everything. The process never stops. I learn something on every movie, short, project on which I work. And work on as many projects as you can to learn how sets are run, protocols, hierarchy, etc. NYFA: As the founder of your own production company, what entrepreneurial advice would you give new producers looking to start their own companies? CB: Get a really GOOD Entertainment Attorney and a GREAT Accountant!!! NYFA: As Chair of Diversity Development at NYFA, what do you feel both film schools and the film industry as a whole can do to increase diversity and equality in Hollywood? CB: How long do you have? I will give you a story about another college, Princeton. This was years and years ago, but one day Princeton, located in NJ, looked around and realized that they had more international students than local students. They went out and actively recruited. When you are systematically kept out of anything, it is up to that institution, workplace, etc. to go recruit. I am not saying that NYFA has kept anyone out of anything. I mean the industry as a whole. The other thing is to acknowledge that racism, sexism, etc. exist in the industry. If you want to try to eradicate the “isms”, you have to actively do something about it. I want to let our minority students here in the US know that you can follow your dreams. We have a wonderful place to get a great education and we are here waiting for you, to give you all of our advice. This is how we give back. 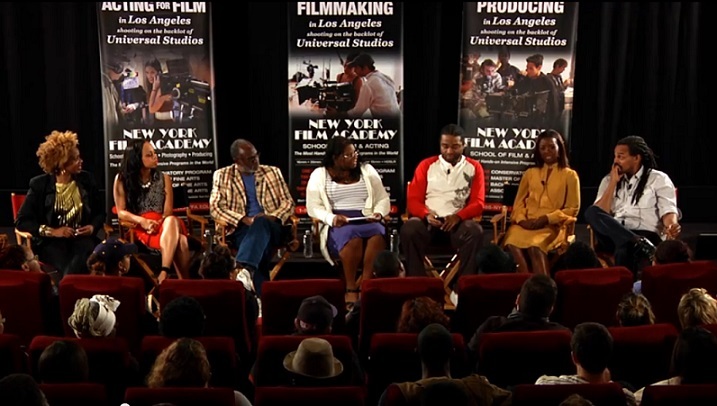 NYFA: What advice would you give to NYFA students to get the most out of their time at the Academy? CB: Work on as many films as you can. Take advantage of every program, competition, group and activity. Network, network, network with fellow students and the town in which you reside. NYFA: If you could go back in time and talk to yourself at the beginning of your career, what would you have suggested you do differently? Or do you believe learning through mistakes is the best way a filmmaker can grow? CB: Hang in there; it always gets better. I won’t do anything differently, I like my mistakes; they make me who I am. NYFA: Having studied film at both NYU and AFI, what sets NYFA’s filmmaking program apart? CB: NYFA Students own their films. That’s AWESOME! NYU and AFI own my school films. NYFA: Do you have any parting words of advice for NYFA students and aspiring filmmakers? CB: In LA, CA, shop the 99 cent Store; it will save you a ton of money. Ramen noodles, the kind you get packaged, can be stretched by adding potatoes to it…lol. But seriously, work on your craft everyday. You have no ego; you haven’t been doing this long enough to have an ego. Be nice to everyone and every time you get to work on a project, be thankful, be humble and remember you are one of the lucky ones.